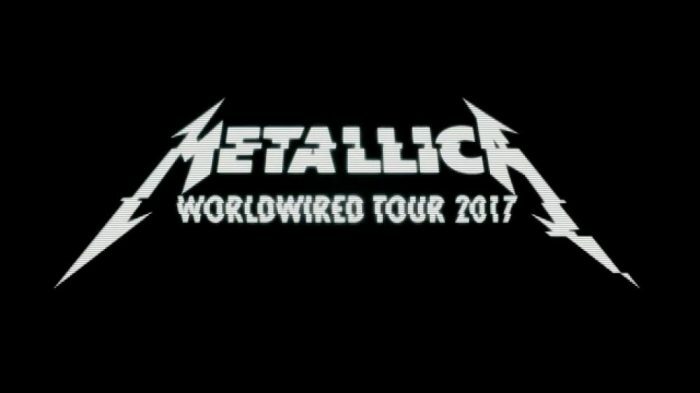 METALLICA x NAKATOMI 2017 Summer tour VIP series is a wrap! 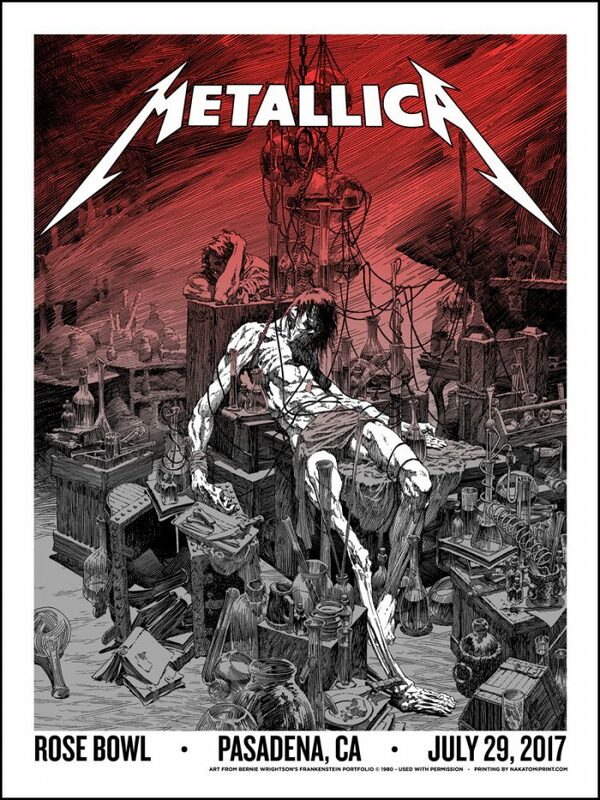 The Metallica Summer tour VIP poster series produced by Nakatomi is now at an end! 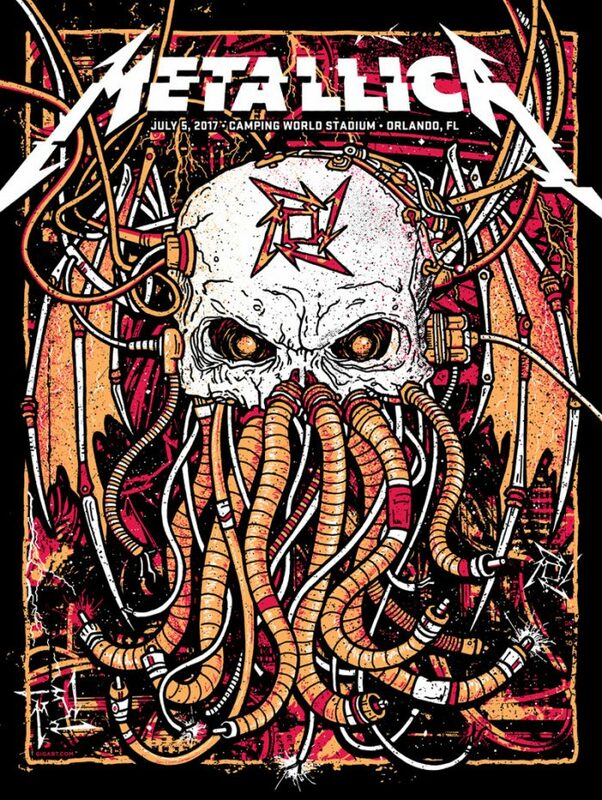 Earlier this year, Nakatomi was approached to produce the posters for the VIP packages for the North American dates of Metallica’s World Wired Tour. This was the biggest and most high-profile project we’ve ever worked on. 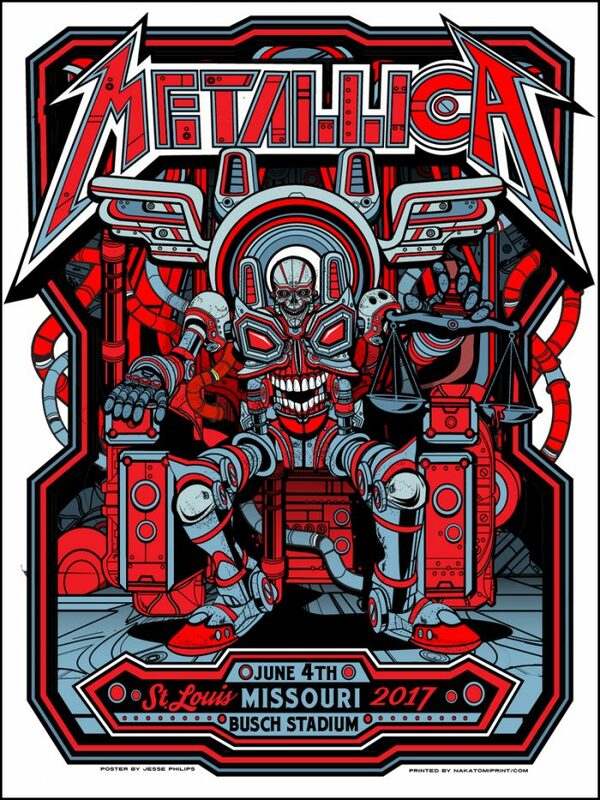 Metallica wanted 23 posters by 23 different artists, for 23 different dates- and they wouldn’t know the final quantities on what they needed for each night more than a few weeks out, when ticket sales closed. The quantities needed for each night topped out over 2000 posters for most of the dates! Nakatomi handled all artist relations and guided the approval process for each poster from concept sketch to final image with a back and forth with our merchandise contact. We managed all aspect of production, shipping, and delivery of each poster to their respective venue- as well as the printing, distribution, and sale of the artist’s copies of their prints when needed. (Note- some artists opted to sell their copies on their own web-stores). All in all, it was an incredibly smooth process, and I couldn’t be prouder of my team for handling the logistics, as well the group of artists we worked with and the amazing work they produced. Getting the chance to book artists for this series- many of them good friends, and frequent collaborators from Nakatomi, as well as reaching out to legendary poster artists I hadn’t worked with before was an amazing experience. Looking forward to our next project and future clients that we can bring this level of skill to! NOTE- there are still a FEW of these posters still available HERE. Supplies are limited, though! Here’s a look at EVERY single print in one place, in order by date- artist’s names listed with links to their websites, as well as a bit of commentary from me! 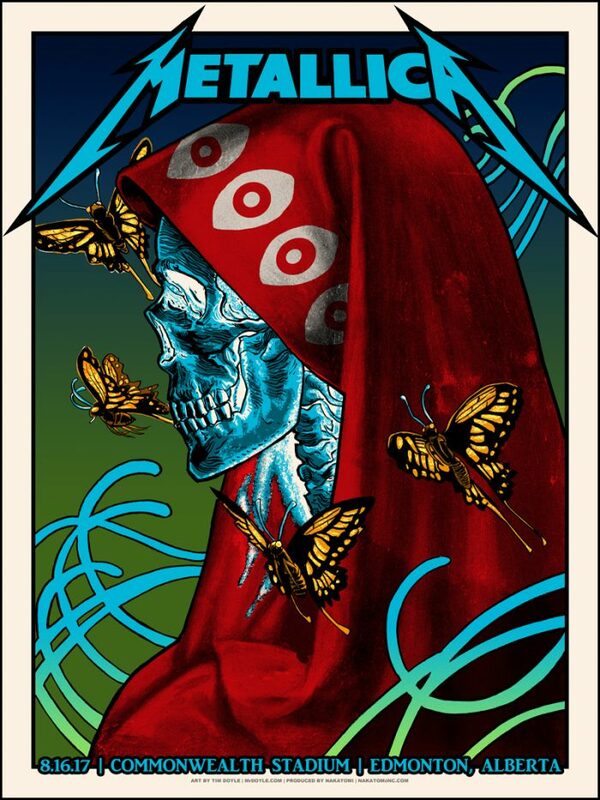 Matt is a great artist, a real rebel in the poster art scene, and it’s always a pleasure to work with him. He was the first artist to turn in his work after approvals, so he was the first date on the tour! He’s got such a killer design sense and ability to stack up all those amazing frames and flourishes, you can’t NOT recognize a Blunt Graffix print immediately. Matt printed his own AP’s on silver holographic foil- one of his trademarks. Check ’em out HERE. Jason Malmberg is a new artist for us, and we’ve used him several times on our ongoing Kings Of Leon tour series. He’s quick, dependable, and clearly takes risks. 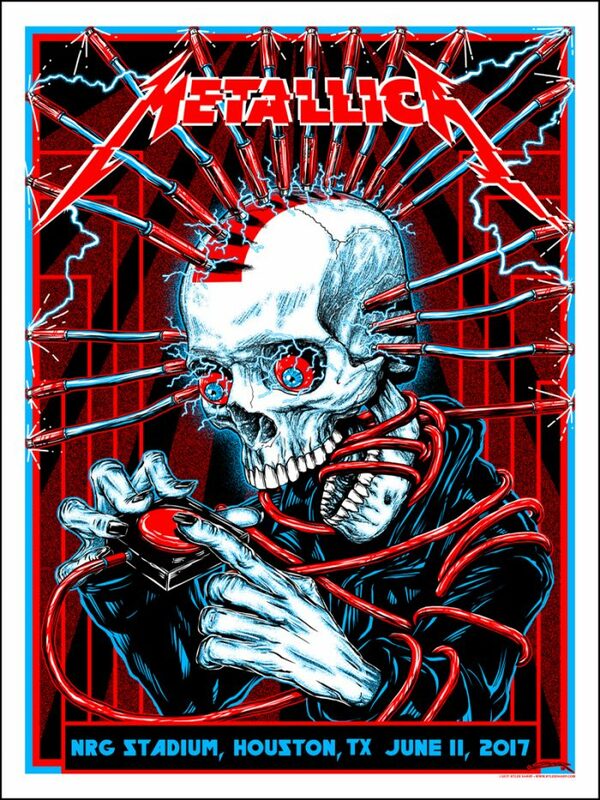 This was one of the most daring compositions that we received for the whole tour- shunning all the expected iconography of a Metallica poster, and still capturing the feel of the band. Check him out HERE. 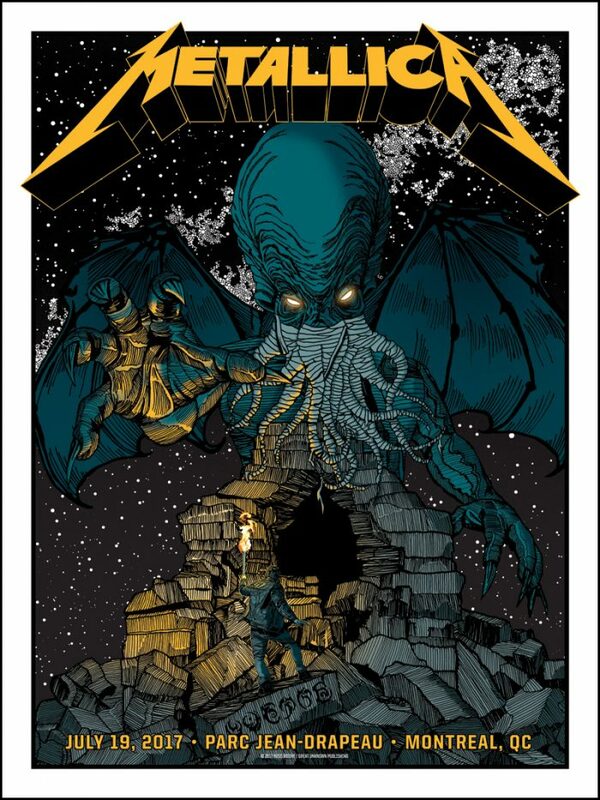 AngryBlue was also a new artist for us Nakatomi- but he’s been cranking gigposters and prints for a long time now. 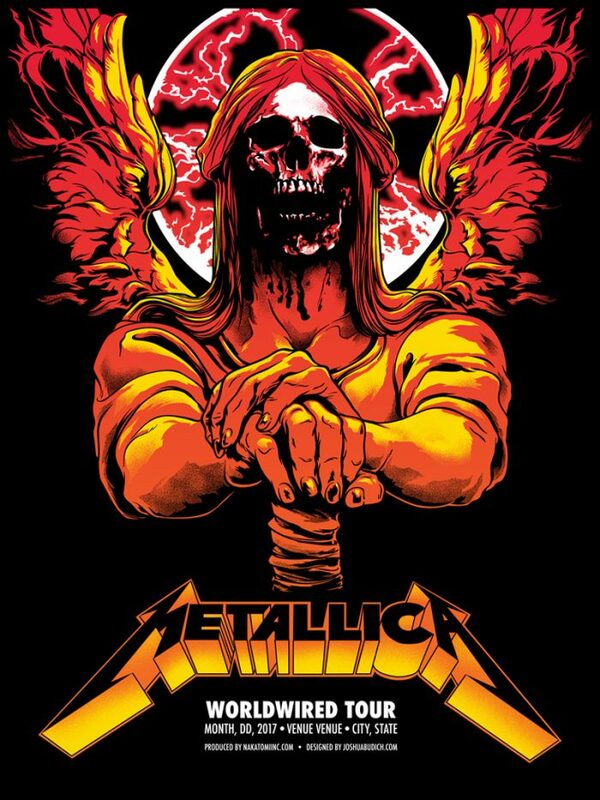 A total professional, he blew us away with the speed at which he turned around this illustration, while also riffing on the new Metallica track, “Spit out the Bone”. Screen printing for a new artist is always a bit of a learning curve, but AngryBlue was ready to roll immediately- always a bonus on a project with deadlines as serious as this one. Check his site out HERE. Florey’s is just a killer artist, and I’m always excited to work with him on something new. 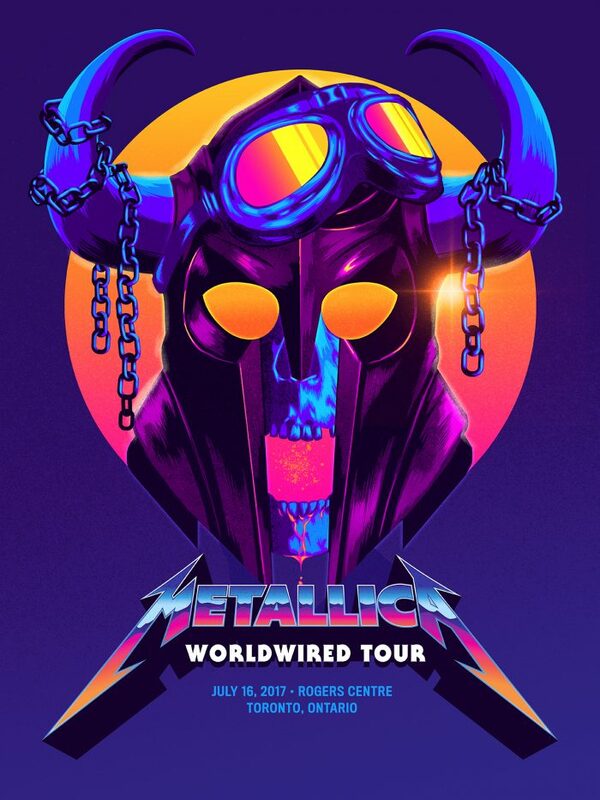 Hailing from Australia, he’s not had an opportunity to do a gigposter before this, and Metallica is just about the biggest band in the world! What a way to start! We’re so glad to get him this gig. Florey really got a lot of color range and depth out of the limited palette he had to work with. 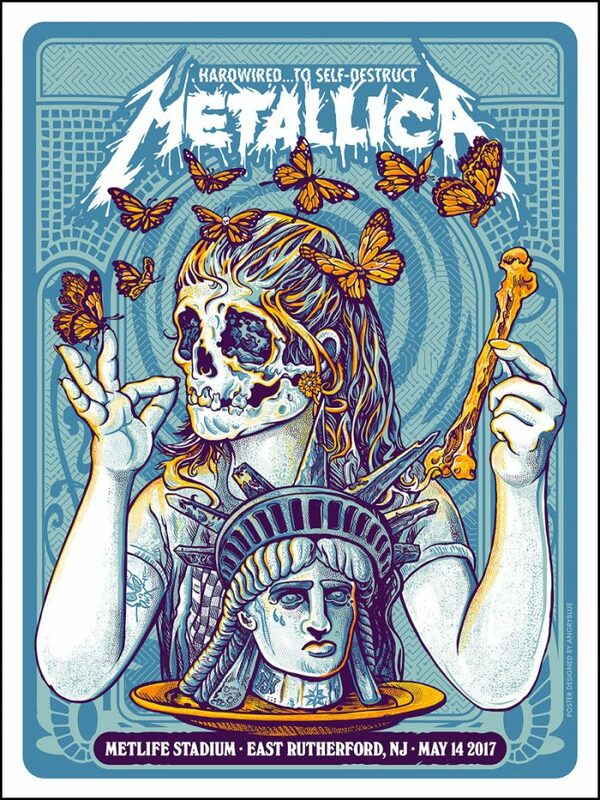 This print is a great interpretation of the “Moth Into Flame” song by the band. Check his site out HERE. Josh Budich is a good friend, and ALWAYS a dependable artist to work with. 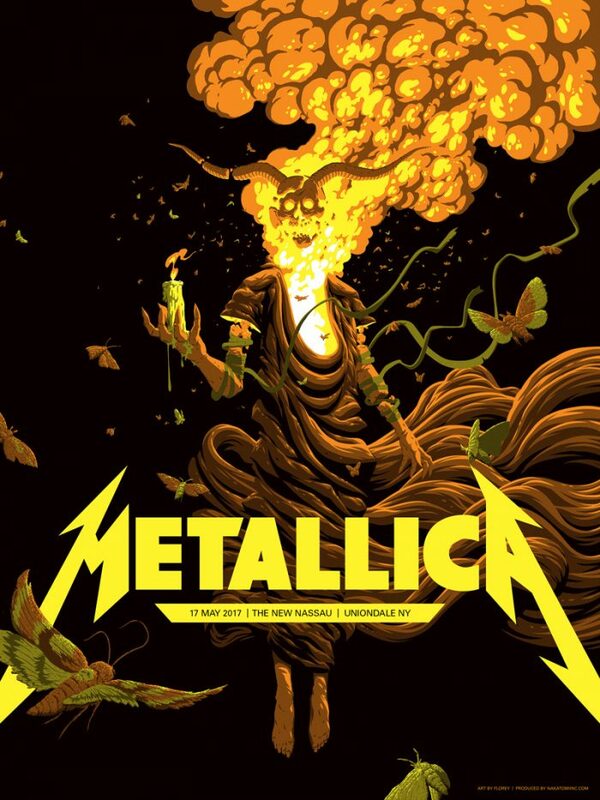 He normally does more ‘friendly’ properties than Metallica, so it was great to see him stretch his artistic wings, and deliver some heavy-rock goodness. Check his site out HERE. Jesse Philips is someone I’ve been working with for over 10 years now. Back when I used to run Mondo (Mondotees) I knew if there was a movie with a robot or mech, he’d be the guy to call, and he’d deliver amazing, fully realized posters with original type from scratch! 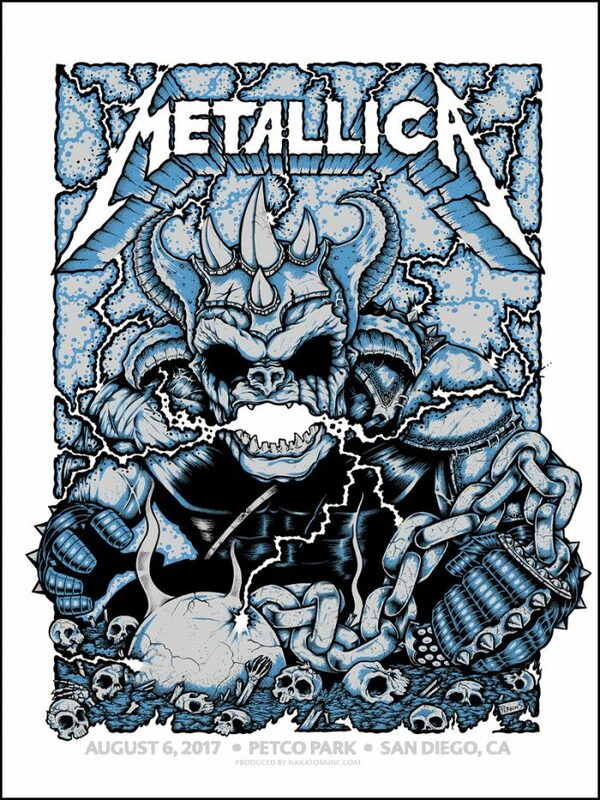 (Look at that custom Metallica logo!) He also produced some very much NOT- robot themed posters for movies like “Fistful of Dollars” – don’t pigeon-hole him! Check out his work HERE. Laurie is an artist I’d been admiring for a while now- his particular style reminds me of Euro-comics with a nerd-art sensibility, with great detail and textures, while also showing a restraint and economy of line, letting the colors breathe. I’m a huge fan, and I’m happy I was able to get him aboard for this tour! Check his art out HERE. Kyler is a fellow Texan, and we’ve done some printing for him in the past here at Nakatomi Print Labs. A frequent gigposter artist, Kyler has some serious clients under his belt, and we were excited to have him contribute to this series. A Houston resident, Kyler asked up front for the Houston show to rep his hometown! Kyler was one of the first artists we asked, as we got this gig right before Flatstock in Austin back in March- and Kyler always attends as a vendor. Check out his site HERE. Tyler Skaggs is a long time Nakatomi employee, and last year stepped into the role of Shop Manager. Everyone here at Nakatomi involved in production was an artist before coming to work for us. 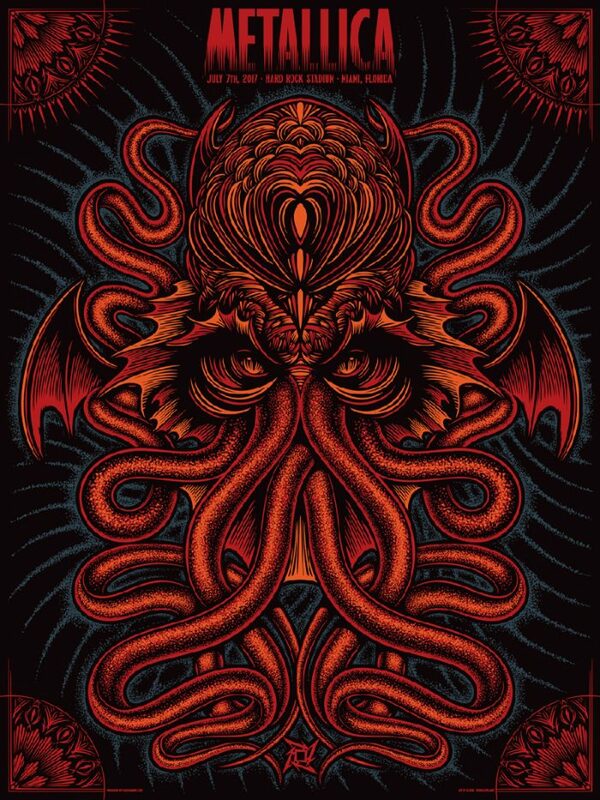 I really dig on this print- I love the stippled textures in there, and the unworldly-ness of the tentacles- as if they’re glowing from an internal light. You can see more of Tyler’s Work HERE. Justin is 1/3 of the classic PNE gigposter/design trio (all of which were able to work on this series), and has been working in the Gigposter industry for 25 years now. (Holy geez! That’s a long time!) I had never had the chance to work with Justin on a project before, so I was stoked to be able to check that off my bucket list. See Justin’s site HERE. Miles is way too talented for his age. Still in his 20’s and he can draw circles around most artists I know. 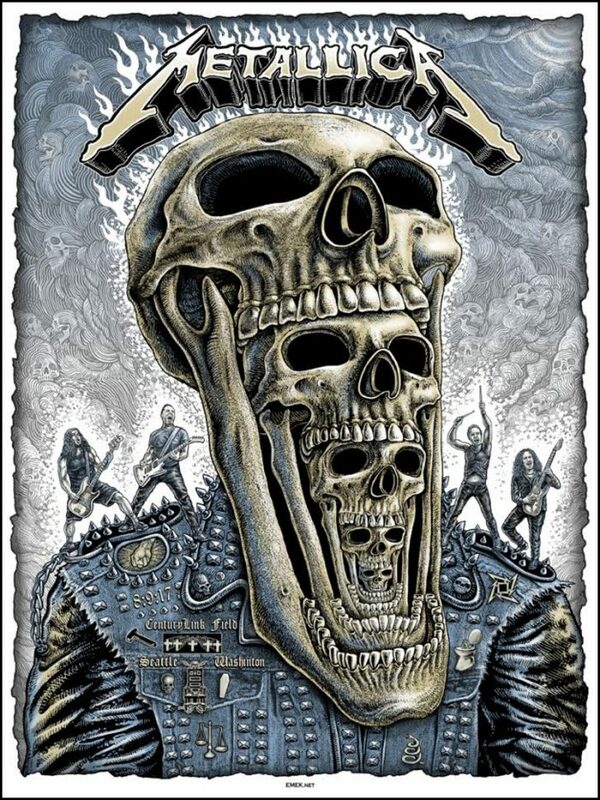 The detail on the print is amazing in person- hitting that classic ‘metal’ vibe just right. Miles was standing RIGHT next to Kyler Sharp at Flatstock when I was first talking to him about the series, and while I knew him by name- I didn’t realize that was who was standing there. So when he asked to be on the series, I told him to ‘send me a sample of his work’ and handed him a card. When I found out I had been talking to Miles, I face-palmed HARD. I knew his work- NO NEED FOR SAMPLES, MILES. Sheesh. See more of his amazing work HERE. Gigart was someone I always ran into at SpokeArt shows in San Francisco- and I was happy to bring him on. He also is in possession of probably the BEST url name for someone in this line of work. You can see more of Gigart’s work HERE. Todd Slater is another one of those artists I’ve been working with on and off for over a decade at this point. He produced several pieces for me at Mondo back in the day (Goldfinger and Clerks being real standouts). This piece- especially the Silkscreened AP artist copies, look AMAZING in person. Metallic silver accents and STRONG reds really make it pop. Todd’s a fellow Austinite, and always the nicest guy in the room. Check out his site HERE. I’m a big fan of Josan’s work. I backed his recent Kickstarter without knowing much about him- totally based on the strength of the images. His acid-neon colors, and Geof Darrow-by-way-of Heavy Metal Magazine line-work is exactly the kind of artist I wish I was. 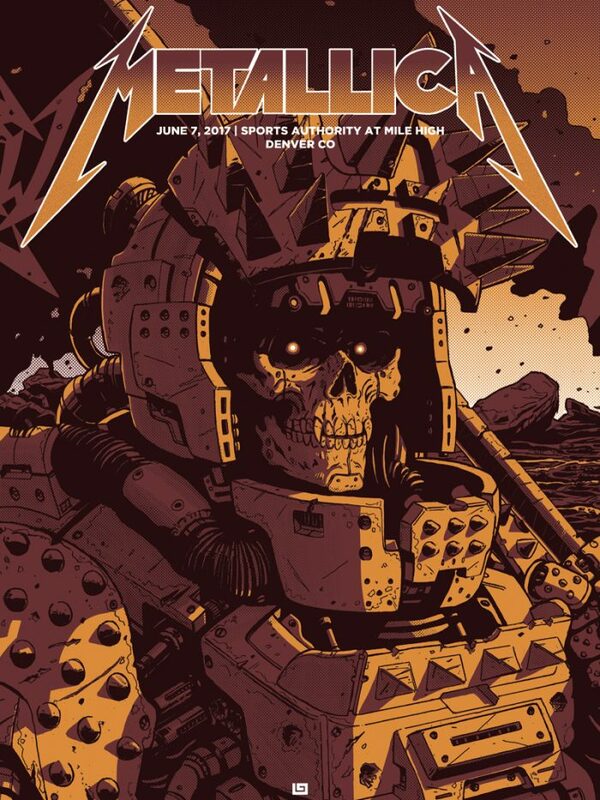 He and Laurie Greasley are frequent collaborators, and I can’t believe we got them both. Check out Josan’s Cyberpunk world he’s created on his site HERE. Dan Grissom was a Nakatomi printer and designer who did the layout for my UnReal Estate book, and a lot of the design work for the Cycle of the Werewolf Kickstarter. Dan already had an impressive portfolio before he came to work for us, and he JUST left the company to go work full-time freelance art on his own! The parting is bittersweet- It’s sad to lose such a talented artist and printer, but great to know the skills and connections he picked up while working for us helped him get closer to achieving his dreams! Dan still handles some special projects for us, but now we gotta wait in line with the rest of his clients! (sigh). Check out Dan’s work HERE. James White is someone I’ve been internet-friends with for a while now, and I can’t believe I finally got him to do a poster for us! He most recently designed the RogueNASA logo that we used in our fundraiser for STEM education, and coming back to work with us here on this was a real treat! 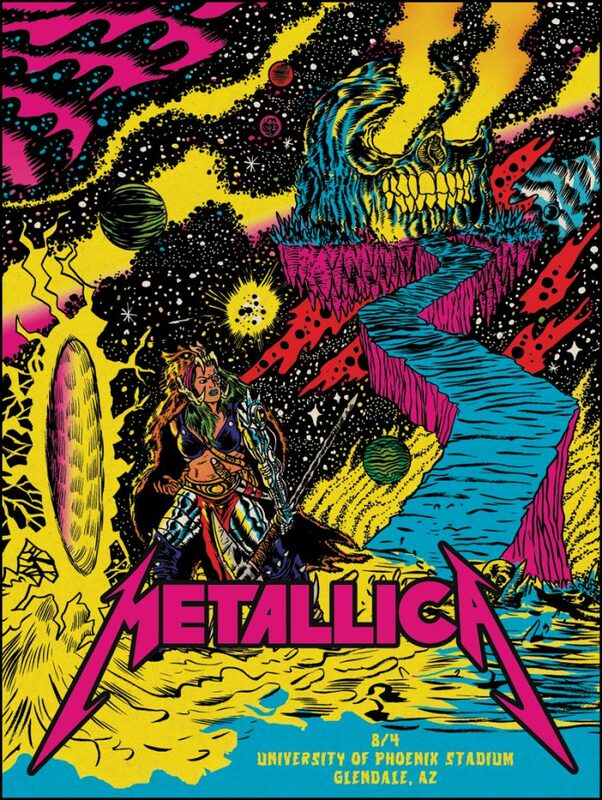 James’ client list is INSANE- and I’m glad he’s found so many people willing to go along with his 80’s Trapper Keeper Cover/ Neon Nightmare that he rocks so well. I get accused of using too many bright colors from time to time, but standing next to James’s supernova of color…everything else pales in comparison. 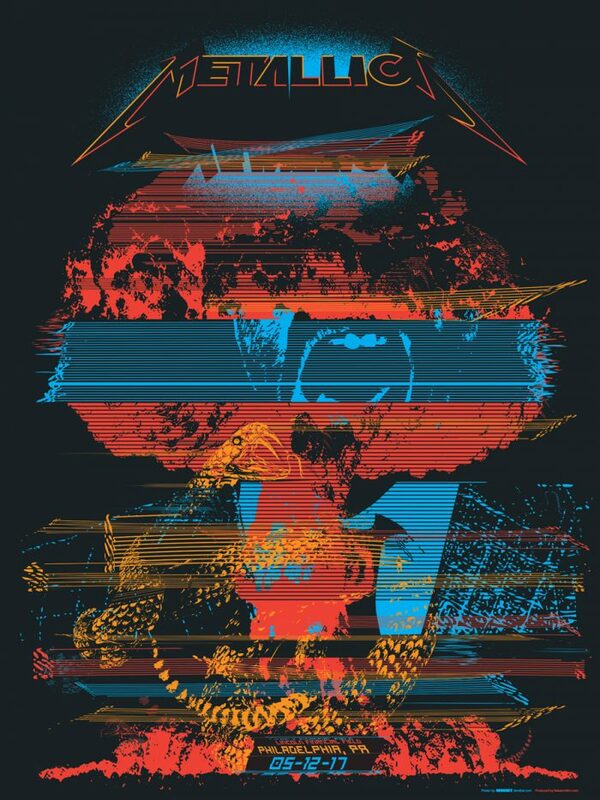 Check out James’ work on the SignalNoise site HERE. Russ Moore is another good friend, and an ex-Austin resident. (Come back!) 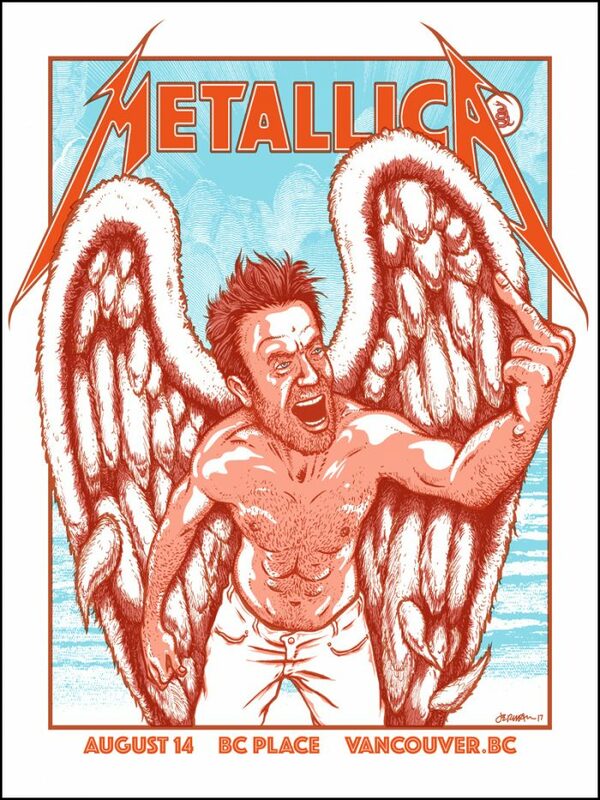 Russ was definitely the biggest Metallica fan I knew, so obviously he got a call. We’ve published and printed a lot of Russ’ work in the past, and hope to have him back in the future! Check out his site HERE. We’ve been publishing Bernie’s work for years now, and this was one of the last projects I had discussed with his wife Liz, back before he passed earlier this year. When we were originally approached to do this series, I wanted to have EVERY poster be a different illustration from his Frankenstein adaptation. 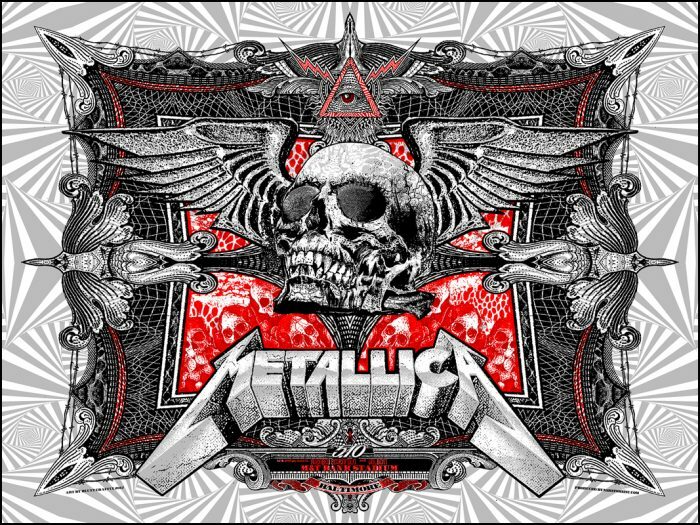 The title of the album Metallica was touring for this year is called “Hard Wired to Self-Destruct” and I’d be hard pressed to find a better description of Frankenstein’s monster than that. While the band wanted to have 23 different artists, they were fans of Bernie’s work, and requested it be used for the Pasadena show, which had sold out even before we were brought on board. The real touchy thing was adapting Bernie’s work to have color- even with permission, it still felt somehow sacrilegious. Artist Dan Grissom did the color treatment on this print, and using a simple split-fountain I think was the best solution- it allowed the figure to pop out a bit more, without taking away anything from Bernie’s amazing linework. You can see more of Bernie’s work on his site HERE. I am a BIG FAN of Alexis’ work. When I first picked up his SPACE RIDERS comic (written by Fabien Rangel Jr.) I fell in love. The wild abandon he takes with his brush work, and the SCREAMING colors he uses tickled my brain. When I reached out to him, I found an old email in my account from him dating back to 2009- the year we founded Nakatomi! He had sent me his portfolio way back then, and nothing ever came of it. We were still new and I was still getting my footing running a business and dropped the ball. It was so great getting to loop back around for this project. Note- Alexis will be attending STAPLE! Media Expo here in Austin next month! See Alexis’ work HERE. Billy is ANOTHER one of those guys I’ve worked with for 10+ years. Billy did killer work for me back in the day at Mondo, and he’s still out there, slaying demons with his brush and nib. 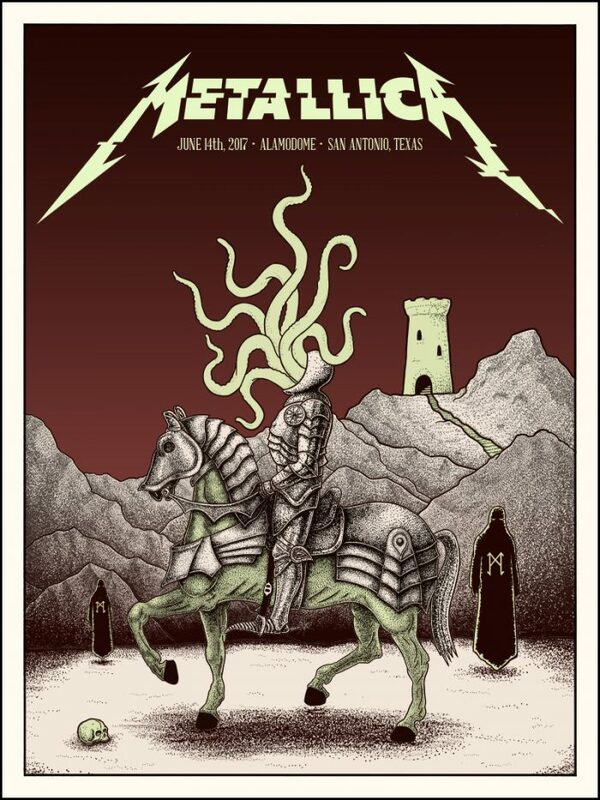 Billy’s an old-school Flatstock artist and rocker here in Austin, and I’m always glad to have him on board. Billy doesn’t have a site up, yet- but stay tuned, we’ve got more in the works with him! Emek, like Hampton up there, and Rogers below, was part of the PNE holy trinity back in the day, and while we’ve done some work with him before, this is the first time I’ve been able to get him on a poster gig! I don’t know what to say about EMEK that hasn’t been said already- the man is a legend, with a legion of fans, and a master at his craft. Working with EMEK was smooth as could be, and I hope to do so again in the future! Check him out HERE. Jermaine is also a guy I know from back during my tenure at Mondo, and forms the final third of the legendary PNE group. Jermaine is a legend, a fellow Texan, and is always quick with a story and Yoda-like advice. Glad to have had him in the roster here. Check out Jermaine’s site HERE. The final print in the series was by me- more due to scheduling concerns than anything! This piece was inspired by the The Fabiola Project, which recently was installed in a Houston museum. The exhibit consisted of 100’s of original paintings- all reproductions of a long lost painting of the Roman Saint Fabiola. It’s simple composition and portrait for some reason has resonated with several artists for decades now, each of varying degrees of skill, and widely different interpretations. This was the starting point for me, and I obviously skewed towards Mucha with the flourishes. You’re already on my site here- Nakatomi, but you can also see my portfolio on TimDoyle.com. 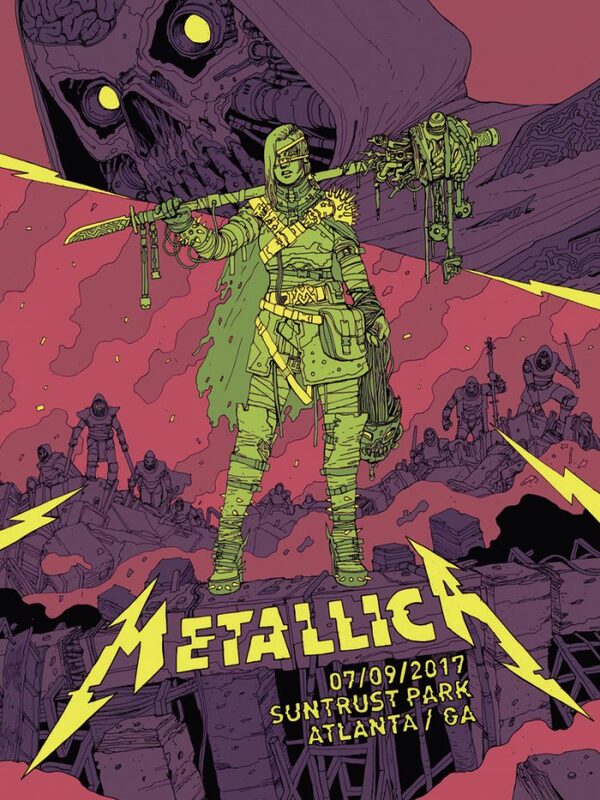 Thanks to the Nakatomi team for making this go so smoothly, the artists for their amazing work, and Metallica and their merchandise partner for the gig! On to the next big thing! 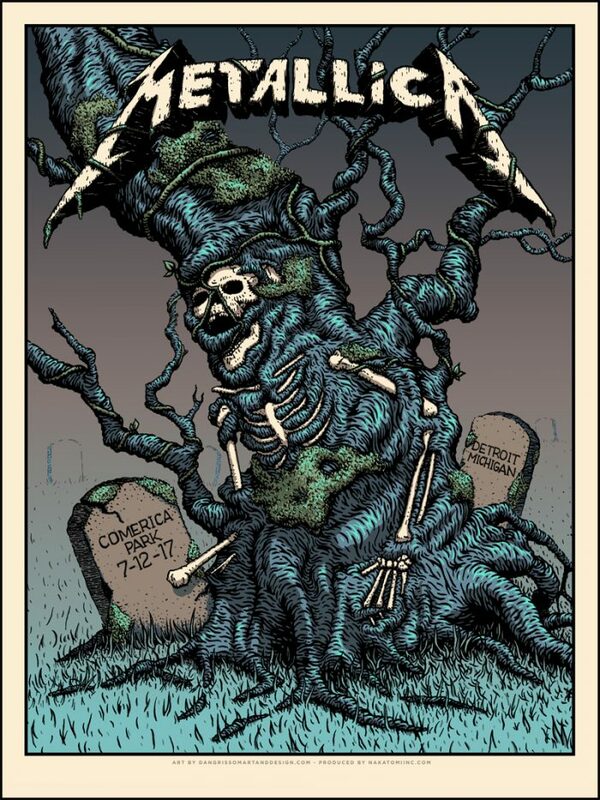 PS- note- does YOUR band or client need a tour poster series? It just may be easier than you thought...Hit us up through the contact form, and let us help you! 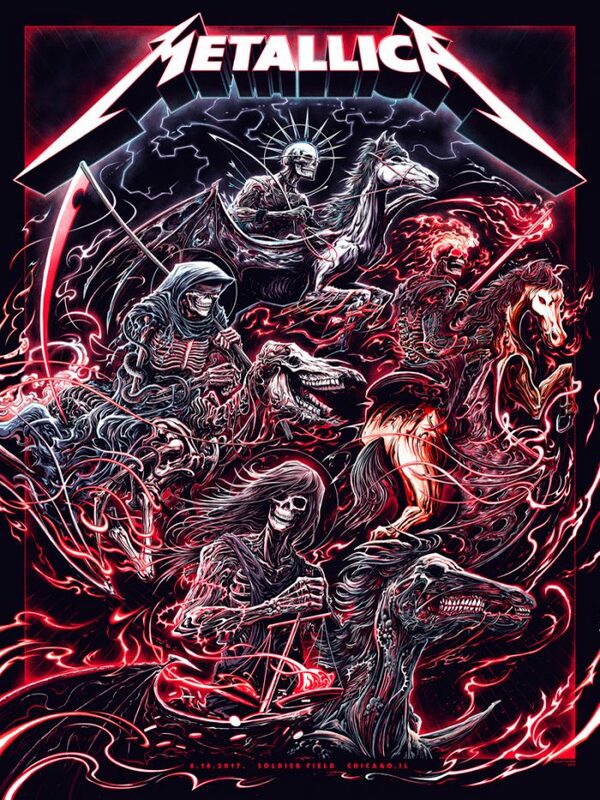 ← NAKATOMI x METALLICA- Edmonton print by Doyle!